Campfires aren’t just for the woods anymore. As backyard design becomes more creative and complex, sales of fire pits have skyrocketed. They provide a spot to hang out and socialize, roast marshmallows and stay warm on chilly nights. There are two basic types of fire pits - permanent and portable. Permanent fire pits are custom built as permanent fixtures of the lawn by a landscaper or contractor, while the portable or freestanding versions can be purchased at a big box store or online, self-installed and moved around. Most fire pits burn either wood or gas. Gas fire pits are a little more convenient because you can simply turn the fire on and off, but they’re more expensive. People who prefer the real crackle and burn of a fire tend to prefer wood fire pits. Any type of fire pit, permanent or portable, needs to be set on top of a natural and fire-resistant surface such as brick, stone or concrete. However, regular concrete tends to look plain and boring, while brick and stone are expensive. Stamped concrete is a popular compromise because it is less expensive than brick or stone but more attractive than plain concrete. Stamped concrete is made by laying regular concrete, coloring it, and then stamping it with a decorative pattern. When stamped concrete first emerged as a decorative technique, there were some bugs to work out. The color didn’t always look great, and the finished product was a far cry from natural stone. However, the technology has greatly improved. With a skilled contractor or landscaper, stamped concrete can be mistaken for concrete pavers or natural stone. 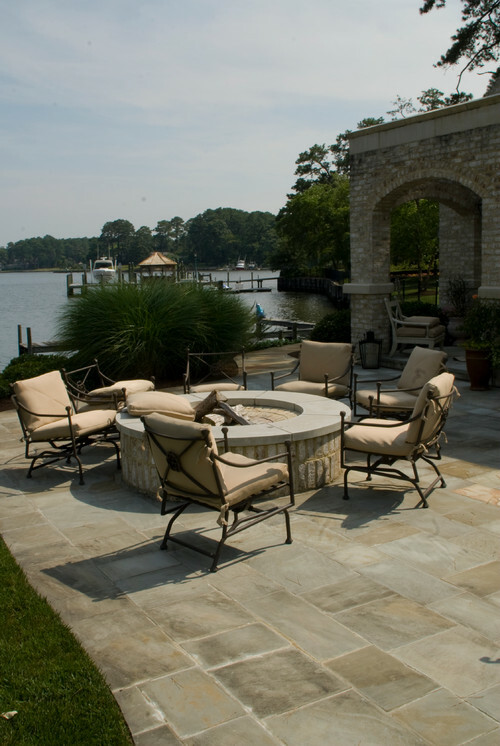 Stamped concrete is often used to create a large patio area surrounding the fire pit. More than just a safety barrier, the patio provides a place to hang out. 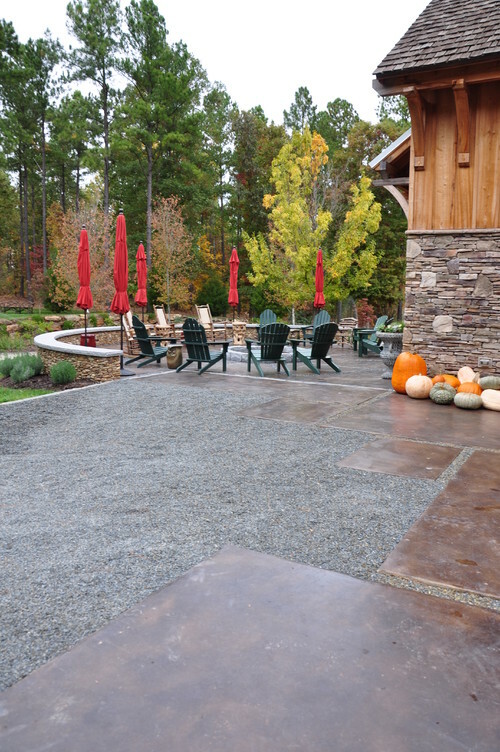 In this photo, the stamped concrete patio looks convincingly like natural stone. This look is a little different - less like natural stone but still attractive and inviting. Stamped concrete is available in about any color and design combination you can imagine. Just keep in mind that custom and complex jobs come at a higher price. This fire pit is a little more cozy and inviting. 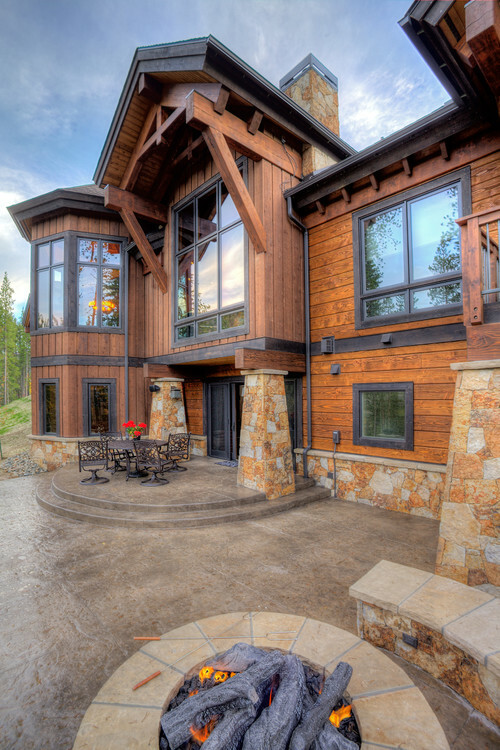 Notice the walkways in the back, which are also made of stamped concrete. They mimic the look of concrete pavers. 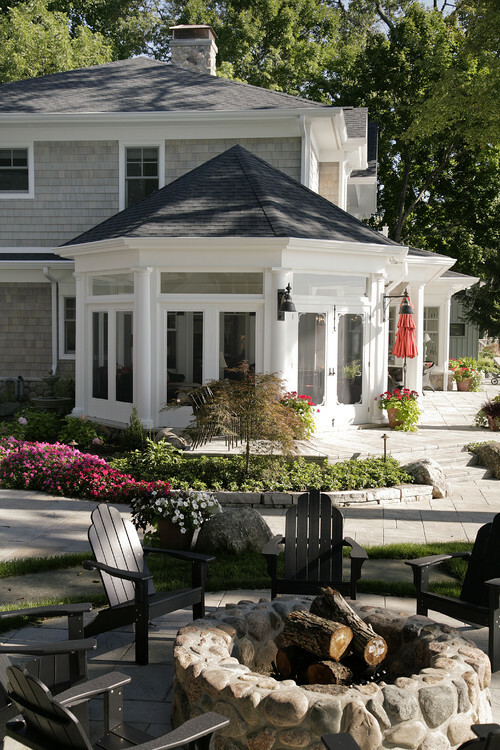 Traditional Patio by Goshen General Contractors Martin Bros. Contracting, Inc.
Here’s a completely fresh take on a fire pit. It’s set in back of the seating area, but that doesn’t take away from it being the focal point. The concrete here is much more simple and subdued, but the clean lines work. In this design, the fire pit creates one of two separate seating areas. The coloring of the stamped concrete creates a warm, rich vibe that compliments the fire pit. 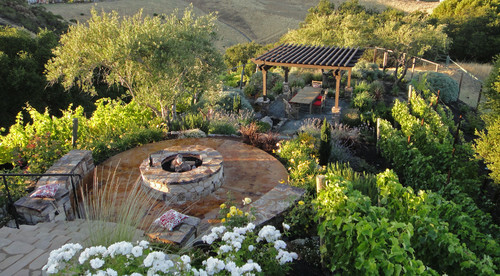 Traditional Landscape by Walnut Creek Landscape Architects & Landscape Designers Alder Group, Pool and Landscape Co. This entertainment area is situated outside of the homeowner’s barn. Stained concrete slabs with slate chips were used for the driveway and pathways. The fire pit, although it’s hard to see, is made of granite. Saving money by using stamped concrete is a great way to free up money in the budget for luxuries like granite.